I met Lynda about a decade ago. A striking woman with an unassuming confidence about her. A skilled businesswoman, an entrepreneur, a sincere friend – a woman who has enormous capacity to build great relationships. Lynda’s commitment to educating the nation and her focus on giving every child a stable foundation for the years ahead is remarkable. I love her insights into the different phases of life and the transitions people go through as they move from one chapter of their life to the next. Lynda is a producer, a contributor, a nation builder. I value her work and I know she has left her indelible imprint on many people and organisations around the world. Above all, Lynda Smith is a mentor. The commitment and calibre of a mentor such as Lynda, is a rarity these days. My life is richer because Lynda never got stuck at the Crossroads. Are you at a Crossroad in your life? Do you find yourself at a crossroad in your life? I know it can seem confusing, feel overwhelming and may make you want to retreat to what is familiar – even though the familiarity might be the very reason you are deeply desiring change. You have to take a risk to get out of the rut. Crossroads can be challenging but they can be a catalyst for change, depending on how you view it. Think on this for a moment: What if you see the crossroad not as an obstacle, but as a threshold? A threshold is a doorway, a new starting point, a crossing over. A groom carries his new bride over the “threshold” which symbolises their “crossing over” to a new life together. The threshold is an invitation to step into a new day, a new way; it all depends on how you see it. If you wish to change anything, you first have to change the way you see it. You may be facing retirement or retrenchment. Read Lynda’s story and be challenged to enjoy your transition to a new future. Lynda will inspire you to REFIRE not retire. My life started with a happy family unit. I cannot ever remember any pain or financial challenges in my early years. Even when my Father died when I was 13, he had ensured that we would continue to live the same quality of life. I am the eldest of 4 children and I know that his death was traumatic for all of us. For me personally, I think I took on the role of adult at this early stage and that this may in some ways have affected some of my decisions and life choices later on. Every girl needs a Dad in this stage of life to help model our transition from child to adult. I carry the entrepreneurial genes from my dad and I am so grateful to have a Mom who was strong and able to take on the role of single parent of 4 small children and to ensure that we would all become independent, educated loving adults. I married my best friend at 20. Two beautiful children followed in my early twenties. Justin and Bronwyn changed my life forever. I did not expect to feel such a strong maternal pull when my children were born. I had great plans to take up a professional career alongside motherhood. This became my first big crossroad. I made the decision to work from home and find any kind of work that would put money in the bank, so that I could fulfil my passion of motherhood. I become a committed Christian during these early days of motherhood and I am grateful every day for this decision that I made. God knew me before I was born and I would certainly need to lean heavily on my Heavenly Father many times in the years ahead. The decision to work from home affected us financially. This was not easy for someone who had never experienced any financial challenges in earlier life. I do believe that struggling through because you believe in something greater than yourself is a good thing and one learns character lessons for life. I became interested in early childhood development when my children were small. I was fascinated by how much they absorbed through play and engagement. This led me to join the world of educational toys and I started selling to other parents as part of my income stream. We moved often in those early years of marriage and I was always able to use my career in education to help meet similar parents with each move. We moved 7 times in 7 years and I am so grateful for the people I met on this part of my journey. Each experience and part of our journey brings us closer to fine tuning the road of destiny that is our gift from the Lord. A month before my 40th birthday my life took a turn into the deep valley of pain. My husband made the decision that he no longer wanted to be married and left the home. The children were 14 and 16. The trauma that I experienced on the inside is a pain that many will identify with. I did not choose this crossroad but I still needed to live through it. On the outside I needed to survive and continue as best as I could with “normal life” while dealing with my inner turmoil and pain. The journey back to wholeness took a long time. I spent many months in counselling, prayer and after two and half years was brave enough to go on a divorce recovery course. Forgiveness took a long time, but I know that this process is necessary for healing. Friendship and love from family and friends also played a major part in my healing. This crossroad brought many changes. A loss of dreams that I now needed to bury, as well as the fear of coping financially on my own are two of the major ones that will affect me till the day I die. The greatest lesson I learnt during these early years while the children were still at home was that they did not choose the divorce and that they should never be used as ammunition in the discussions around money and time. I wanted my children to grow up to be happy, healthy, loving adults even though their Mom and Dad no longer lived under the same roof. This is not easy, because you have to put your own feelings of anger and the future on hold for the sake of your children. I am grateful today that I made that sacrifice. I am also grateful that we have continued to keep a good relationship for the sake of our children and now our beautiful grandchildren. At this stage of my life, my career had taken me back into the workplace. I was still involved witheducational products and was now a minority shareholder in a company where we were teaching parents how to play with their children and had a national footprint throughout South Africa. Four years after my divorce the business started to unravel due to the death of the founder. I worked long, tough hours as the sales and marketing director to keep my side of the business going. We went through three changes of executive leadership within 3 years and I felt that I had reached a major crossroad. I was earning a great salary and had shares in the business. It was not an ideal time to leave since I was a single parent, but I was burnt out, knew that I could not solve what was happening and I had a sense that it was time to close this door. It was a time of transition. An invitation to cross over the threshold. I took a giant leap of faith and put in my resignation. The day after my resignation I had two calls that would take me forward to the next part of my journey. My lessons here were aboutreleasing my status and money for growth and change. We need to listen and obey “that still small voice” before new opportunities unfold. We need to replace fear with faith. Closure here took a long time – like my divorce. I loved the company and the people and did not want to leave but knew that I needed to for my future survival. The two opportunities that came my way enabled me to firstly assist the founder of the MYSCHOOL card program build and expand the business around South Africa – and secondly to help Graeme Codrington with sales and marketing for a new company he was starting called TomorrowToday. At this point, I chose to do both as a consultant and take back responsibility for my own work journey rather than be employed. New opportunities bring new learning, skills and relationships. You just have to have the courage to pursue them. Writing your own salary cheque each month is not always easy but keeps you relevant and adding value. It opens doors that you can never imagine or even dream about. Trust in the Lord with all your heart, and lean not on your own understanding. In all your ways acknowledge Him and He will direct your paths. 2005 was a very big year. My two children both made the decision to marry the love of their lives and also both left the country. My daughter, a missionary in Thailand married a Thai missionary and my son and daughter-in-law made the decision to move to the UK to advance their careers and to travel. This very sudden empty nest took me by surprise and I have to admit that I went into a season of holding a rather lengthy “pity party”. I questioned what life was about and what I was to do now? The term “empty nest” certainly is real and was a BIG crossroads for me. I had suppressed my own dreams for the sake of the children and now needed to look to the future – alone. Roots and wings is part of the journey of parenting and in some ways with mine being so far away, I had no choice but to face the future alone. Parenting is only part of our journey and change brings growth if we will embrace it. I held on to this verse in this season to keep me going. But those that trust the Lord will find new strength. They will be strong like eagles, soaring upward on wings. The will walk and run without getting tired. The next two years brought my current contracts to completion. It was a time of reflection and uncertainty. Woolworths bought MySchool and my role at Tomorrow Today was unfolding around a new trend of the Baby Boomer generation and the future of retirement. The sale of the business where I was a minority shareholder happened in 2007, five years after I had left. Defining one’s purpose takes time and needs to be addressed as the seasons of life change. As I turned 50 at the beginning of 2007, I had the possibility of a new business and no income. I was standing on the edge of life and the next season was on the horizon. I was determined to stay close to where the Lord wanted me to be and not to just go and look for a job. As we reach this season we move from success to significance and I wanted to make sure that I stayed on the path I saw ahead. I made the decision to move out of the city into a community where I would feel safe and have time to heal. I decided to go back and study and did a yearlong certificate course in Social Entrepreneurship at Gordon Institute of Business Science. Two grandchildren were also born in these 2 years as well as the birth of my own business calledRefirement Network. My lack of income, the recession and trying to get a new business off the ground in the season of global meltdown was not easy for me and I know the same applies to many others. I started to use my life savings to cope with my daily expenses. In 2009 the money ran out and I was on the verge of my first big contract. I kept my eyes on the promises of my Lord. I spent many hours in prayer, waiting on the promises that I felt were just out of reach. Sometimes the money needs to be removed from our lives to see the miracles waiting to be possessed. I am so grateful to a few friends who supported me both emotionally and financially in this season. This was without a doubt my most humbling time in my life and I learnt some deep character lessons. This message from 2 Kings, Chapter 4 helped me in this season. Emptiness is a gift from God. Emptiness tells us we have a need. It is possible that we may not be empty enough. We must admit our emptiness. Only God can truly fill us. 2010 was a very good year. The big contract materialised and helped me get back on my feet. I had finished my studies and had a big vision for Refirement Network. I wanted to influence as many baby boomers as possible to take up a second career to help bring about some form of social change in our beautiful Nation Of South Africa. We are the first generation heading towards that life stage called Retirement – with at least 20 to 30 healthy years ahead. I want to help educate this group to find a passion and a purpose and use the talent and skills they have for something bigger than themselves. Our Nation needs us and we will certainly enjoy the benefit of living a life filled with meaning, as we head for old age. At the end of 2010, I was approached by a philanthropist to head up a new Foundation for parenting and early childhood development in South Africa. This was a perfect fit for me. I was leading my challenge to others by using my skills and passion for parenting, applying all that I had learnt on my social entrepreneurship course and living out my own personal REFIREMENT career. The future now looks bright. My wonderful children have produced four beautiful grandchildren (sadly still far away). I do meaningful work that rewards me well financially and I have made myself part of a a community that cares about me and where I feel useful. Daily I get to help others find meaning and purpose in their own lives and to understand the transitions that baby boomers will go through, as well as help them plan their next life stage. Secondly, to help build a Foundation that is dedicated to bringing about long term change for early brain development in all children and to assist parents to understand how important their roles are in their Children’s lives, gives me immense fulfillment. The Lord has restored my life’s purpose in many more ways than I ever could have imagined. Go to www.refirementnetwork.com and www.brainboosters.co.za for more details. The future lies ahead. 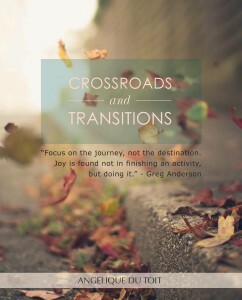 There will be more crossroads and transitions. It will not matter what happens as long as I follow what the Lord desires for my life. There will be more valleys and mountain tops. It will not matter if I am in a valley or on a mountaintop, I will bless HIS name. All glory and honour belong to the Lord and I am so grateful for that day many years ago when I made a decision to follow HIM. Thank you for sharing your story and for the contribution you make to our nation, Lynda. I know that readers who do make contact with you will be transformed in the way they view their REFIREMENT stage. This article was posted in People Who Found Their Courage.